After 20 years as a community-college faculty member, I think I can speak for most of my colleagues when I say it's not the "service" part of that thoroughly despised phrase we object to. We all understand that teaching is, at heart, a service profession. That's why most of us got into it in the first place. What bothers us is the suggestion that our students, while sitting in our classrooms, are customers. Because words have meaning, and that particular word carries some pretty dangerous connotations in an educational context. For one thing, when students hear it, their first association is with that famous if not necessarily correct adage, "The customer is always right." You can read the rest via the link. Here's news that gives new meaning to the "turning wheel": Manchester has been chosen as the location of Britain's first Las Vegas-style casino. 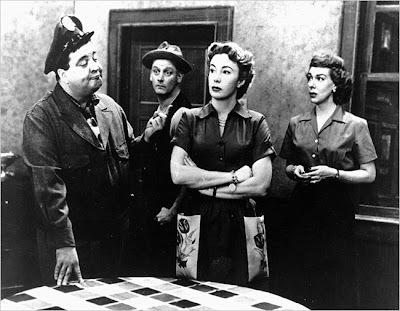 It has been 56 years since Miss Randolph assumed the role of Trixie, yet she is still revered as the surviving goddess of the celebrated screwball comedy from the golden age of television. "It is a boon traveling companion, without which I do not function, I cannot operate. It has been with me for 21 years." "Do you actually mean it's been as close a companion to you as Bach has been in your musical career?" I just found a wonderful clip on YouTube, Glenn Gould talking about his chair with filmmaker Bruno Monsaingeon. I suspect that this conversation, like other Gould-Monsaingeon conversations, was scripted by Gould. In a small town without public transportation (semi-rural sprawl, it could be called), getting into one's car or mini-van or pickup-truck or SUV to drive a mile or two to "the store" seems to most people as necessary and unremarkable as breathing. My wife Elaine and I prefer to walk, whenever possible, to do this sort of errand. And we thus become, at times, figures who prompt curiosity. For we are simply walking, not in exercise clothing but, more conspicuously, in what my high-school gym teacher used to call "street clothes." People tell us that they saw us walking back from the grocery store and wondered if our car was in the shop. Then, they say, they realized that we were just walking. Our town is not friendly to walkers. The traffic signals at our major intersection (which spans four lanes of traffic and two turning lanes) flash WALK only briefly before beginning to hammer out a warning. Even the fastest of walkers (me) cannot cover more than three lanes before the warning begins. A major thoroughfare near our college has nothing more than a flashing yellow light to make it easier for people to cross, and for most drivers yellow seems to mean Keep Going, Don't Slow Down -- certainly not Yield. And speaking of college -- college students are about the only people in town for whom walking is a standard mode of transportation. In our elite subdivisions, one can drive on street after street and never see a biped. In my more modest neighborhood, there are many people whom I have never seen leaving the area on foot. The saddest indication of our town’s preference for wheels: the only parts of town with significant foot traffic (older streets with student-rental properties) are also the parts with the poorest sidewalks. “I would love to live in a world where I knew the eggs came from happy chickens. But in Brooklyn? That’s not going to happen." A clutch of modern pagans honored Zeus at a 1,800-year-old temple in the heart of Athens on Sunday -- the first known ceremony of its kind held there since the ancient Greek religion was outlawed by the Roman empire in the late 4th century. The group ignored a ban by the Culture Ministry, which declared the site off limits to any kind of organized activity to protect the monument. But participants did not try to enter the temple itself, which is closed to everyone, and no officials sought to stop the ceremony. Dressed in ancient costumes, worshippers standing near the temple's imposing Corinthian columns recited hymns calling on the Olympian Zeus, "King of the gods and the mover of things," to bring peace to the world. A library's neglected shelves reveal the demise of something important, especially for young readers starved for meaning -- for anything profound. Still, I'm not ready to throw in the towel just yet. Elaine Fine just alerted me to the web presence of a company marketing a replica of Glenn Gould's chair (news found via Soho the Dog). The chair is the creation of the designer René Bouchara and the Italian furniture maker Cazzaro. Glenn Gould's piano chair is a story in itself, and Kevin Bazzana tells it in his biography Wondrous Strange: The Life and Art of Glenn Gould. Bert Gould customized a folding chair for his son in 1953 (what used to be called a bridge chair, for use at a cardtable), cutting several inches off each leg and adding a bracket and half-turnbuckle so that the height of each leg could be adjusted. Gould used the chair for the rest of his life. In the 1959 film Glenn Gould: On the Record, the chair can be seen (in Columbia's Manhattan recording studio) with white tape strengthening the intersections of legs and seat. In later photos the seat's stuffing is spilling out from the back. Later still, the seat disappeared altogether, leaving only a wooden frame. One of the most poignant photographs I know is this shot (by Lorne Tulk) of Gould's Toronto apartment, taken in 1982 shortly after the pianist's death. Gould's chair cannot certainly be considered of the universe of design. At maximum it reminds a style chair, which original model has been modified for two times. The first time because the mechanical of the folding chair had damaged its shape. The second time because Glenn’s father, Bert Gould, had stricken on it a deathblow [!] by cutting off ten centimetres from every leg and by fixing on them a jack. . . . Since Gould chair has become famous together with him, until becoming indivisible from his image. While the piano player became a legendary, his «chair-object» became «chair-worship». Alas, this project reminds me of fake Rosebuds and Casablanca barware. And I'm put off by the slightly sniffy tone in the above passages ("cannot certainly be considered of the universe of design"). 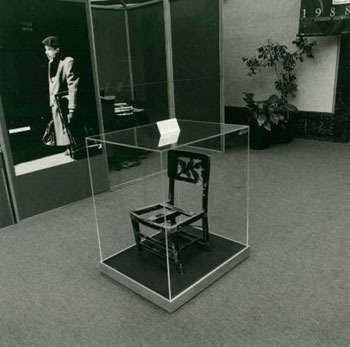 But I do want to get to Ottawa one day, to the National Library of Canada, where the Gould chair, the thing itself, now sits on display in a glass case. 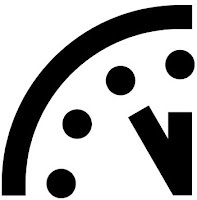 The Bulletin of the Atomic Scientists (BAS) is moving the minute hand of the Doomsday Clock two minutes closer to midnight. It is now 5 minutes to midnight. Reflecting global failures to solve the problems posed by nuclear weapons and the climate crisis, the decision by the BAS Board of Directors was made in consultation with the Bulletin's Board of Sponsors, which includes 18 Nobel Laureates. . . .
By moving the hand of the Clock closer to midnight -- the figurative end of civilization -- the BAS Board of Directors is drawing attention to the increasing dangers from the spread of nuclear weapons in a world of violent conflict, and to the catastrophic harm from climate change that is unfolding. The BAS statement explains: "We stand at the brink of a Second Nuclear Age. Not since the first atomic bombs were dropped on Hiroshima and Nagasaki has the world faced such perilous choices. North Korea's recent test of a nuclear weapon, Iran's nuclear ambitions, a renewed emphasis on the military utility of nuclear weapons, the failure to adequately secure nuclear materials, and the continued presence of some 26,000 nuclear weapons in the United States and Russia are symptomatic of a failure to solve the problems posed by the most destructive technology on Earth." Philip Larkin, "A Study of Reading Habits"
The major finding of this annual national study is that today's entering undergraduates are arriving on campuses highly motivated to complete their college degrees. Yet at the same time, many admit they do not enjoy reading and bring less-than-ideal study habits to the classroom. These numbers are, among other things, a study in irony: a "very strong desire" to continue one's education apparently need not manifest itself in "very careful notes" or "very hard" studying. I'm struck too by the number of students who aren't willing even to pretend that books have been important in their lives. They've probably had their fill of such pretending for now, having cranked out college-application essays about their passion for learning and the way in which reading [Insert Your Title Here] changed their lives. The speaker in Philip Larkin's poem "A Study of Reading Habits" comes to his cynical conclusion about books in middle age. 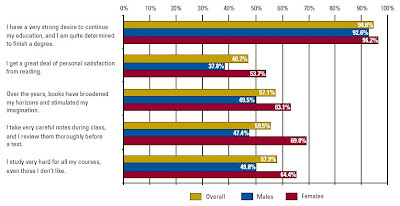 The average age of the respondents to the freshman survey is 20. ¹ This post marks the first -- and perhaps last -- appearance of a bar chart on this blog. When I'm reading a student's essay and see a significant writing problem, I'll often write this sentence: "If you'd like some help, just ask." Alas, many students are reluctant to do so. They often believe (as I know from talking with them) that they "can't write," that they're "no good" at writing. They make that point about themselves in harsher, cruder ways too. Such students seem resigned to getting along as well as they can. But some students do come in for help during office hours. The help that I offer sometimes involves talking through the process of organizing ideas into an essay. Sometimes it involves matters of paragraphs — stating, developing, and keeping to a main idea without getting lost in tangents. Most often the issue is punctuation. I've found that taking just thirty or forty-five minutes to show a student how to find and fix comma splices or run-on sentences can go a long way toward solving the problem. It's useful for students to keep in mind that a college campus is in many ways a vast, standing offer of help. That offer doesn't always come in the form of a personal invitation. But it's there. So if you're baffled by a microfilm machine or by the arrangement of the library stacks, ask a librarian. If you need to get in touch with a professor who's on sabbatical, ask a department secretary (secretaries are often the most helpful and well-informed people on campus). If you're trying to cope with an impossible roommate, talk to a resident assistant. If you're in emotional or financial difficulty that threatens to overwhelm you, make an appointment with a counselor. If you're wandering the labyrinth of a classroom building in search of a room number, ask someone who works there. And if you have questions about the work of a course, talk to your professor. There are questions that in retrospect might seem naïve (or even stupid), but it's better to ask them and get them cleared up than to let them go unanswered. I can remember as a college freshman mistaking the vast library reference room for the main stacks. I'm glad I asked for help. Asking for help should never be a matter of asking someone else to assume responsibility that's yours. It's comically inappropriate to ask an instructor to proofread an essay for you before you turn it in (yes, that happens) or to step unannounced into a professor's office and ask for a stapler (yes, that happens too). But a legitimate request for help will likely meet with a generous and kind response. That can be the case in the so-called real world too. Thanks, Elaine, for suggesting this topic. 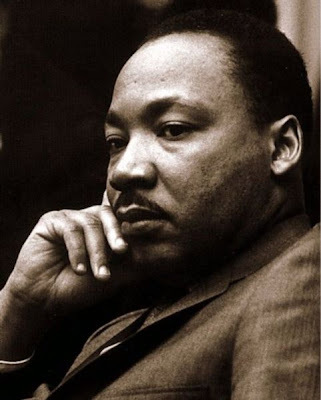 The Reverend Samuel "Billy" Kyles, a Memphis minister, recalls listening to Martin Luther King's last speech. King was leaving to have dinner at Kyles' house when he was assassinated. Here's another free tool for writing, Sadhana Ganapathiraju's Blockwriter (Windows only), inspired by Khoi Vinh's still-hypothetical Mac program of the same name. Blockwriter offers an extremely simple (some will say limited) writing environment: no deleting by backspacing; no cut, copy, or paste; no options to change window size or font size. The delete key replaces letters with bullets. There is no option to print, but Control-S will save what you've written as a text file. If you click to close the program before saving, there's no prompt asking if you'd like to save your work. The most enticing feature, for me, is the dark screen that covers the desktop (and any other open windows) as long as Blockwriter is running. Blockwriter is alpha software, with at least two possibly annoying problems. One: if you minimize the Blockwriter window, everything remains dark, with no way to get the program back (it's necessary to call up the Task Manager -- Control-Alt-Delete -- to close the program). Another problem (explained on the programmer's website) involves involuntary auto-scrolling. Blockwriter might be a little extreme for ordinary writing (I'm always fixing typos on the go, so I miss the backspace key), but it might be just the ticket for someone who needs to eliminate all distractions and get something said. 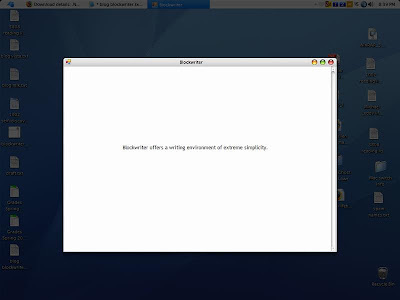 Blockwriter offers a writing environment that manages to be both austere and inviting. Update, January 22, 2007: A new version of the program fixes the two problems described above. Thanks, Sadhana! WFMU's Beware of the Blog has made available for download a 1972 LP, Play It Safe! Vol. 4. It's a recording of a man and woman talking, to be played over and over to fool would-be burglars into thinking that someone is home in an empty house. The record came with a set of "special reusable ties" with which to rig various turntables and let the record repeat. She: Why not go out and get some nice clothes for the nice frame? He: What, that funny stuff they're makin' now? She: It's not all funny. He: Well, it looks funny to me. She: What's funny about it? He: Well, they take -- they take some of the older stuff and they jazz it up too much, you know? Too many pockets on stuff now. She: I can take pockets off. He: Either that or they don't put any pockets at all. She: I can put pockets on. He: Well, what's the sense of that? She: Well, if you need it. He: Oh, I'll tell you what -- the ones I buy with pockets, you take them off . . .
She: [Laughs.] I'll save the pockets . . . He: . . . and you put 'em on the ones that don't have them. She: . . . and put 'em on the ones you don't want, right. He: That makes a lot of sense, you know? That makes as much sense as my going out shopping for myself. She: I'll go with you! After a couple of weeks, this couple (and Kool, and the Gang) disappeared. When I'm in a supermarket and hear this song playing over cheap speakers, my memory can still supply the bass line, same as it ever was. We love stories, and we will continue to love them. But for more than 30 years, as Theory has established itself as "the new hegemony in literary studies" (to echo the title of Tony Hilfer's cogent critique), university literature departments in the English-speaking world have often done their best to stifle this thoroughly human emotion. Above, the opening paragraph of a powerfully argued piece by Brian Boyd (author of a great two-volume Vladimir Nabokov biography) on culture, biology, and the present state of literary studies. In past eras, good high schools provided the educational foundation for an intellectual awakening in college. But for the mostly affluent students in private and competitive public schools -- from T.J. (as Thomas Jefferson is known) to urban intellectual cocoons like Bronx Science and Stuyvesant -- high school has become the defining academic experience. The much-touted leap to higher education has become more of a lateral step, or even a letdown. "Our students find college not as challenging," says Temba Maqubela, dean of faculty and assistant head for academics at Phillips Academy, the boarding school in Andover, Mass. Former students have written to him expressing frustration with college courses that are too basic. (Consider this collegiate-sounding offering from Andover’s English department: "Feasts and Fools: The Topos of the Festive Social Gathering.") Andover alumni tell John Rogers, dean of studies, that college "is not as difficult as their experience here," he says. According to Walt Mossberg's favorable review of Office 2007 in the Wall Street Journal, the large blue "ribbon," as it's called, cannot be customized. There is though an option to auto-hide it. Me, I'm sticking with my simple Word set-up. "Hey, are you really the ski patrol?" In a comment on an earlier post, Jeanne Meyers recalled James Brown's brief appearance in Ski Party (1965). I found the clip on YouTube. It's a remarkable bit of Americana. Four suavely-dressed African-American men enter a ski lodge, having rescued a frozen "Mr. Pevney" from the cold. The lodge is filled with young white adults. One of them recognizes that the newcomers are not the ski patrol but "James Brown and the Flames." (That should be Famous Flames, young lady.) The expectation is that some entertainment is in the offing: "You're gonna sing for us, aren'tcha?" says another young woman, who was wondering one paragraph up whether these men were really the ski patrol. What strikes me is not that a star is expected to entertain (hey, I want to hear him too) but that JB and company don't stay a moment longer than their performance. JB is, literally, out the door when his song ends, and the Flames are gone before that. There's no question of inviting these men in as guests, to sit, warm up, have some cocoa. There's no time for JB and the Famous Flames even to pick up their coats (or JB's skis). They save a life; they sing and dance; and they disappear into the cold. At least they're wearing ski sweaters. And let the record show that not even a ski sweater could stop James Brown from being James Brown. A compact fluorescent has clear advantages over the widely used incandescent light -- it uses 75 percent less electricity, lasts 10 times longer, produces 450 pounds fewer greenhouse gases from power plants and saves consumers $30 over the life of each bulb. But it is eight times as expensive as a traditional bulb, gives off a harsher light and has a peculiar appearance. Which is what makes Wal-Mart’s goal so wildly ambitious. If it succeeds in selling 100 million compact fluorescent bulbs a year by 2008, total sales in the United States would increase by 50 percent, saving Americans $3 billion in electricity costs and avoiding the need to build additional power plants for the equivalent of 450,000 new homes. Having lived with these bulbs for four days, I can't agree that the light is harsh. Nor am I bothered by the bulbs' resemblance to soft-serve cones. (Don't people usually keep their lightbulbs under shades or enclosed in fixtures anyway?) Compact fluorescent bulbs take a bit of time to reach their full brightness, but their advantages make that slight delay easy to accept. I can remember as a kid having to wait for the radio and television to warm up. I am very optimistic about print as a technology. Words on paper are a wonderful information storage, retrieval, distribution, and consumer product. That is why I appreciate the fact that many Edge forums are transformed into books, and it's why I hope someday that there is a gorgeous Edge Magazine that I can flip through and touch. Imagine if we had been getting our information delivered digitally to our screens for the past 400 years. 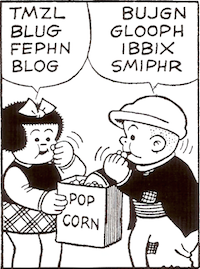 Then some modern Gutenberg had come up with a technology that was able to transfer these words and pictures onto pages that could be delivered to our doorstep, and we could take them to the backyard, the bath, or the bus. We would be thrilled with this technological leap forward, and we would predict that someday it might replace the internet. From the Edge Foundation's 2007 forum, "What Are You Optimistic About?" Elaine Fine makes perfect vegan banana bread, as she herself agrees. My wife Elaine and I just discovered a wonderful film, Ernst Lubitsch's Trouble in Paradise (1932). Now I understand what the phrase "the Lubitsch touch" means: Trouble in Paradise is one of the wittiest, most artful movies I've seen. I'll share ninety-two-seconds' worth of dialogue. Waiter: Yes, Baron. What shall we start with, Baron? Baron: Hmm? Oh, yes. That's not so easy. Beginnings are always difficult. Baron: If Casanova suddenly turned out to be Romeo, having supper with Juliet, who might become Cleopatra, how would you start? Baron: Mm hmm. Very good. Excellent. Baron: It must be the most marvelous supper. We may not eat it, but it must be marvelous. Baron: You see that moon? Baron: I want to see that moon in the champagne. Waiter: Yes, Baron. [He writes on a pad.] "Moon . . . in . . . champagne." Baron: And as for you, waiter. Baron: I don't want to see you at all. Waiter: Oh, I beg your pardon. Just some of the elements that make this brief scene especially brilliant: the surreal tedium, which anticipates Dragnet ("And waiter?" "Yes, Baron?" "You see that moon?" "Yes, Baron. "), the waiter's dutiful note-taking, the vaguely suggestive "I want to see, um" (the movie predates the strictures of the Production Code, as other scenes make clear), the final "No, Baron," and the bit with the leaf (which took me three viewings to figure out). As we soon find out, the Baron is no baron. And the Countess is no countess. I'll leave the rest of the story for you, reader, to discover. You think to yourself, "This was made in 1932 for general audiences." What happened? When was America that sophisticated? When was the world that sophisticated, and how could we have gone so far in the other direction?